September 29, 2006John F. Kennedy Space Center Americas gateway to the universe Spaceport News http://www.nasa.gov/centers/kennedy/news/snews/spnews_toc.html Vol. 45, No. 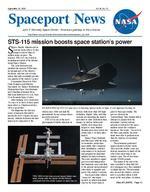 19 STS-115 mission boosts space stations power (See ATLANTIS, Page 4)ATLANTIS AND her STS-115 crew return to Kennedy Space Center on Sept. 21 and approach Runway 33. S pace Shuttle Atlantis and its crew are home after a 12-day journey of more than 4.9 million miles in space. The mission, STS-115, succeeded in restarting assembly of the International Space Station. The crew delivered and installed the massive P3/P4 truss, an integral part of the stations backbone, and two sets of solar arrays that will eventually provide one-quarter of the stations power. Commander Brent Jett, Pilot Chris Ferguson and Mission Specialists Joe Tanner, Heidemarie Stefanyshyn-Piper, Dan Burbank and Canadian astronaut Steve MacLean landed at 6:21 a.m. Sept. 21 at Kennedy Space Center. After landing, Jett commented: Its nice to be back. It was a great team effort, so I think assemblys off to a good start. The flight was the first in a series of missions that will be among the most complex in space history. Atlantis delivered the first major new component to the station since 2002 and laid the groundwork for upcoming station assembly missions. STS-115 is one of the most photographed shuttle missions in history, with more than 100 highdefinition, digital, video and film cameras documenting the launch and climb to orbit. Data from these images, as well as station and shuttle crew inspection, helped to clear Atlantis thermal protection system for return only 2 1/2 days after launch. Tanner, Piper, Burbank and MacLean, with the help of crewmates, made three spacewalks that completed truss installation, enabled solar arrays to be deployed and prepared an important radiator for later activation. They also installed a signal processor and transponder that transmits voice and data to the ground, and performed other tasks to upgrade and protect the stations systems. A new procedure called a camp out was implemented, in which astronauts slept in the Quest airlock prior to their spacewalks. The process shortens the prebreathing time during which nitrogen is purged from the astronauts systems and air pressure is lowered so the spacewalkers avoid the condition known as the bends. On each of the three spacewalks, the astronauts were able to perform more than the number of scheduled activities. The astronauts performed unprecedented robotics work. They used the shuttles arm in a delicate maneuver to hand off the school bus-sized truss to the stations arm. The 45-foot truss weighs 35,000 pounds. The arrays at the end of the truss extended to their full 240foot wingspan once they unfurled on flight day six. The astronauts also moved the stations robotic arm to a position where it will assist in the next phase of station THIS VIEW of the International Space Station was taken shortly after the Space Shuttle Atlantis undocked from the orbital outpost on flight day six. SPACEPORT NEWS September 29, 2006 Page 2 Awards The Kennedy Update Jim Kennedy Center Director H i, everyone. The team has done it again! No matter what happened during the STS-115 mission, from weather delays to debris that needed analysis, the NASA team came together to make this mission look routine, although there was nothing easy about attaching the P3/P4 truss to the space station. Now that space station construction is moving forward and the nation is strongly behind us, we must continue to perform our mission successfully. Doing so will show the world we are up to any task and that the Vision for Space Exploration will make Earth a better place to live. I appreciated how our Administrator, Mike Griffin, took time out of his very busy schedule the day before Atlantis landed to talk to the Kennedy Space Center employees about NASAs future. Mike held nothing back and gave us great insight about how we will simultaneously finish space station construction and begin the Constellation Program. You will start to see changes around the center as we transition our facilities from supporting shuttle and station to supporting the new programs. On Sept. 26, a ribbon-cutting ceremony at the Operations and Checkout Building paved the way for new equipment to be added to support the Orion vehicle as it is built at our center. In the past, this task was performed elsewhere before being shipped to KSC, but this nontraditional work is another example of how your management and local legislatures have worked together to keep jobs at our spaceport. The next launch  scheduled for December using Space Shuttle Discovery  means Atlantis will undergo an aggressive turnaround to be able to serve as the backup orbiter for STS-116, but I know our work force has faced this challenge in the past and will do so again and again. Thats just another of a thousand reasons Im KSC and proud to be!  On Oct. 10, I hope NASA civil service employees will be able to join me and members of senior staff as we kick off the 2006 Combined Federal Campaign at message of community spirit. Im also proud to report the JBOSC-sponsored United Way campaign for contractors raised more than $180,000  an increase of $35,000 over the 2005 total. Way to go! Hispanic Heritage Month began Sept. 15, and today I was privileged to speak at the annual Hispanic Heritage Luncheon at the Debus Center. Charismatic guest speaker Miguel Rodriquez, soon to be returning to KSC, gave us a clear understanding of the work his rocket propulsion team at the Stennis Space Center in Mississippi is performing, as well as his profound pride in his heritage. Look forNow that space station construction is moving forward and the nation is strongly behind us, we must continue to perform our mission successfully.the Training Auditorium with exciting guest speakers, including the United Ways Rob Rains. This charitable campaign not only benefits the community we live in, and beyond, but also fellow employees who have a loved one in need of services. The campaign runs from Oct. 10 to Nov. 7 and key solicitors will talk to workers in groups and one-onone about this annual event. A big thank you to Ray Lugo, Ed Markowski and the campaign cabinet who spread this vital coverage in the next issue of Spaceport News I hope you will take advantage of the Visitor Complexs generous Salute to Brevard Residents Weekend on Oct. 13 to 15, when residents and up to five guests can learn about the colorful NASA story free of charge. Our thanks to Dan LeBlanc and our friends at Delaware North for providing this opportunity. Congrats to all of you for a great STS-115 mission and have a great week! T o show its appreciation for the support of Brevard County residents, the Kennedy Space Center Visitor Complex will present the seventhannual Salute to Brevard Residents free weekend and food drive Oct. 13 to 15. Throughout the three-day celebration, Brevard residents will enjoy free admission to the Visitor Complex by showing proof of residency, in the form of a drivers license or utility bill. The Brevard resident and up to five guests in his or her party will receive free admission. Residents will also enjoy preholiday shopping at the Visitor Complex, with a 10-percent discount in the worlds largest retail Space Shop. Guests are encouraged to bring canned goods and non-perishable Visitor Complex offers Brevard residents free admission food items to benefit the Central Brevard Sharing Center, North Brevard Charities and South Brevard Sharing Center. While not mandatory for admission, the suggested donation is one food item or canned good per guest. Last year, more than eight tons of food was donated, setting a new collection record for this event. The Salute to Brevard Residents free weekend was created in 1999 to thank the people of Brevard for their continued support of the Kennedy Space Center Visitor Complexs mission: to tell the NASA story and inspire people to support the exploration of space. The Visitor Complex opens daily at 9 a.m.THE ROCKET Garden at the KSC Visitor Complex features eight authentic rockets from the past, including a Mercury-Atlas rocket. The garden also features accessible Mercury, Gemino and Apollo capsule replicas, seating pods and informative graphic elements. The Salute to Brevard Residents free weekend is Oct. 13 to 15 at the Visitor Complex. SPACEPORT NEWS Page 3 September 29, 2006STS-121 crew shares mission highlights with employeesSTS-121 CREW members, including from left, Piers Sellers, Lisa Nowak, Steve Lindsey (second from right) and Mark Kelly receive a certificate of appreciation from Center Director Jim Kennedy, Deputy Director for Shuttle Processing Rita Willcoxon and Deputy Center Director Bill Parsons. Below, the standing-room audience at the Training Auditorium. By Linda Herridge Staff Writer I t was standing room only inside Kennedy Space Centers training auditorium as workers gathered to welcome mission STS121 crew members back to the Space Coast. Commander Steve Lindsey, Pilot Mark Kelly and Mission Specialists Lisa Nowak and Piers Sellers returned to share mission highlights and accomplishments from the 13-day mission that began with the launch of Space Shuttle Discovery on July 4. Center Director Jim Kennedy introduced the crew members and welcomed everyone to the presentation. The STS-121 mission confirmed our return-to-flight readiness, Kennedy said. The spectacular launch on the Fourth of July and safe return on the 17th reaffirms the success of the hardworking men and women who diligently dedicated their lives to return to flight following the tragedy of Columbia. Lindsey expressed the crews appreciation for the work force. Were here to thank you for all that you did to put this mission together, Lindsey said. Its your hard work and dedication that helped to make a safe launch possible. The crew members provided narration for a 20-minute video presentation that showed mission activities, including the spectacular launch, docking with the station, three dramatic spacewalks, other station activities and the shuttle landing at KSC. The astronauts answered questions from the audience and, as a special treat, showed approximately 40 of the best photographs taken during the mission. Edsel Sanchez, a NASA electrical engineer in facility electrical system design, attended a crew return for the first time and said the hour-long program was truly inspiring. Sandra Senn, a NASA program specialist in the Engineering Directorate, said she hadnt been to a crew return for a while but decided to come to this one. It was an awesome presentation, Senn said. Kennedy, along with Deputy Center Director Bill Parsons and Deputy Director for Shuttle Processing Rita Willcoxon, presented each crew member with a special mission memento. We commend the outstanding crew and all involved with the STS-121 mission on a job well done, Kennedy said. By Jennifer Wolfinger Staff Writer F or one black bear, the Merritt Island Wildlife Refuge isnt too cold or too hot, its just right. Beekeepers initially detected the bear in July when their hives were mangled. The discovery of bear tracks confirmed that a black bear had been there. In response, the beekeepers, who support Kennedy Space Centers citrus crops and related industry, surrounded the hives with temporary electric fences. Its a good size bear because it has a good size track. My guess is that its just one bear. Like all Bear makes rare appearance on wildlife refuge wildlife, sometimes they roam for many reasons, such as a male looking for a female or if its displaced and looking for a new home, said Ralph Lloyd, the refuges deputy manager. According to him, bears hadnt made a noticeable appearance in the area since the 1980s. The bear recently visited the hives north of Beach Road, was spotted crossing State Road 3 and then was identified near the Shuttle Landing Facility. It hasnt been detected again since August. Most of the bears we encounter are north of Haulover Canal, probably because of the physical barriers such as the bridge and canal. This one just decided to cross, he explained. Were thrilled there is one here, because it is part of Floridas wildlife and this is a refuge. Refuge staff will not try to capture or interfere with the bear. If anyone sees a bear, they should not approach or bother it, though appreciate that its a rare experience. Any definite and verifiable sightings should be reported to 861-0667.A BEAR was spotted near the Shuttle Landing Facility last month. Although not the bear spotted, employees are asked to call 861-0667 if they see a bear on the center. Page 4 SPACEPORT NEWS September 29, 2006 Crew touches down after successful re ATLANTIS . .(Continued from Page 1)construction. After Atlantis undocked from the station, it did the first full flyaround of the facility since prior to the Space Shuttle Columbia accident. The maneuver helped ground crews get a better perspective on the stations environment and overall exterior health. Canadian Prime Minister Stephen Harper made a call during the mission to MacLean to congratulate him on being the first Canadian to operate Canadarm2, the stations Canadian-built robotic arm. After undocking, the Atlantis crew participated in the first threeway call with the Expedition 13 crew aboard the International Space Station and the three crew members of the Soyuz spacecraft on its way to the station. All 12 astronauts in space at that time were able to have a conversation. With Atlantis and its crew safely home, the stage is set for the next phase of International Space Station assembly. Preparations continue for Space Shuttle Discoverys launch, targeted for mid-December, on the STS-116 mission to deliver an additional truss segment and a cargo module to the station. Discovery will also do extensive work on the stations electrical and cooling systems. For more on the STS-115 mission and the upcoming STS116 mission, visit http:// www.nasa.gov/shuttle THE STS-115 crew poses in front of the orbiter Atlantis, which brought them safel y b From left are Mission Specialists Daniel Burbank, Heidemarie Stefanyshyn-Piper an Ferguson, Commander Brent Jett and Mission Specialist Joseph Tanner. THE STS-115 external tank (above) falls away from the Space Shuttle Atlantis. A crew member onboard the shuttle recorded the image with a digital still camera. AT RIGHT, astronaut Joseph Tanner begins attaching the P3/P4 truss during the first of three spacewalks by the crew. BEFORE WELCOMING the STS-115 crew members on their return from space, NASA officials look at the underside of the orbiter Atlantis on the Shuttle Landing Facility. From right are NASA Administrator Michael Griffin, KSC Deputy Director Bill Parsons and Shuttle Launch Director Mike Leinbach. Page 5 SPACEPORT NEWS September 29, 2006 re turn to construction STS-115 mission y b ack from space to Kennedy Space Center. an d Steven MacLean, Pilot Christopher AFTER LANDING aboard Atlantis on Runway 33 of the Shuttle Landing Facility, STS-115 Commander Brent Jett is happy to touch Earth again. He and other crew members were examining the underside of the orbiter Atlantis during the traditional post-landing inspection. ATLANTIS IS moved into the Orbiter Processing Facility after being towed from the Shuttle Landing Facility. Atlantis landed on Runway 33 at 6:21 a.m. on Sept. 21 after the mission. Atlantis traveled 4.9 million miles, landing on orbit 187. In the facility, the process flow will begin to ready the vehicle for its next flight. AT A post-landing press conference at the NASA News Center, the STS-115 crew members smile at a question from the media. Seated from left are Commander Brent Jett, Pilot Christopher Ferguson and Mission Specialists Joseph Tanner, Daniel Burbank, Heidemarie Stefanyshyn-Piper and Steven MacLean, who represents the Canadian Space Agency. Page 6 SPACEPORT NEWS September 29, 2006Sierra enjoys challenges of expendable launch vehicle missions By Linda Herridge Staff Writer A lbert Sierra, chief of the mechanical systems branch in the Launch Services Program, views his 16-year career with NASA at Kennedy Space Center as an opportunity to keep challenging himself. Recently, Sierra received an award at the KSC annual Honor Awards ceremony for exceptional leadership in proactively addressing cross-mission opportunities to enhance the overall management of expendable launch vehicle missions. Pat Hanan, Launch Services Program vehicle engineering division chief, said Sierras experience, strong technical foundation and leadership skills will help to ease the organizations transition to the new engineering directorate. It is awesome to be part of the NASA KSC team, Sierra said. The diversity and talent of the people working here makes the challenging job of launching space shuttles and expendable launch vehicles seem easy. The Brooklyn, N.Y., native moved with his family when he was 10 years old to Puerto Rico. His parents wanted to move from the big city and decided to reunite with other family members in Humacao, a small community on the island country. Sierra earned a Bachelor of Science degree in mechanical engineering from the University of Puerto Rico in 1989 and began working at KSC in 1990 on the shuttle program, in orbiter mechanisms and payload handling. Sierra said the job was unique because it involved working on several shuttle systems, including landing gears, payload bay doors, wheels, tires, breaks, hatches and the software that ran the systems. As a payload handling engineer, Sierra worked on configuring the shuttle payload bay to accept the various payloads. He has worked in the Payload Changeout Room at the pads, the Orbiter Processing Facilities, the Shuttle Landing Facility and other KSC facilities that support the space shuttle. In 1996, Sierra moved to the Launch Services Program to work in the Mechanical and Propulsion Systems branch. Hes remained in the program ever since. Sierra noted the Cassini and Mars Exploration Rovers missions were two of the most significant projects in which he was involved. He said Cassini was a unique mission that required interfacing with the U.S. Air Force and other NASA centers. He worked on the solid rocket motor assembly and testing and payload installation on the Titan IV that launched Cassini. The mission was many years in the making, with literally hundreds of people working on it, Sierra said. Sierra worked as both the integration engineer and the mission manager for the rover missions. He said the mission schedule was challenging because two different Delta vehicles were used to launch the explorers to Mars. We didnt expect the rovers to operate this long, Sierra said. Its pretty amazing, all the information theyre still sending back to Earth. Sierra is working with the Air Force and other NASA centers on the propulsion systems for future vehicles. This includes the RS68 engine which is currently planned for use in the Ares V cargo launch vehicle. Sharing the knowledge and insights we already have on this engine and how it operates will help us develop a common propulsion system for the future U.S. space vehicles, Sierra said. I admire KSC for recognizing the diversity of our work force and paying tribute to the contributions we all have to offer, Sierra said. Im proud to see fellow Hispanics be part of the team that makes space exploration a reality. I look forward to the future and what we have ahead of us. Sierra is married to his wife, Paige, and they have three children, Victor, Harry and Isabel, and one yellow Labrador named Sunny. Sierra enjoys the outdoors, riding his motorcycle and woodworking.ALBERT SIERRA, chief of the mechanical systems branch in the Launch Services Program, began working at KSC in 1990. N ASA will extend its Checkout, Assembly and Payload Processing Services contract for three years with Boeing Space Operations Company of Titusville. The contract extension and modification, valued at $278.5 million, covers Oct. 1, 2006, through Sept. 30, 2009. The total contract value including exercised and unexercised options is approximately $846 million. The contract is a performancebased, cost-plus award fee contract to provide checkout, assembly and NASA, Boeing sign payload processing contract payload processing services at Kennedy Space Center, Cape Canaveral Air Force Station and Vandenberg Air Force Base, Calif. Under the contract, Boeing provides management and technical support of payload processing for the Space Shuttle, International Space Station and Expendable Launch Vehicle programs. Services and support include planning for and receiving payloads, maintaining associated ground support systems, integrating payloads with the space shuttle, and shuttle postlanding payload activities. You set the pace at the 2006 Intercenter Walk/Run E mployees at the spaceport can walk or run where history is made! Beginning at 5 p.m. on Oct. 3, the KSC Fitness Centers will be sponsoring the Intercenter Walk/Run at the Shuttle Landing Facility. The 2mile walk/run, 5-kilometer run and 10-K run are free for all spaceport employees. Participants will receive informational packets about health and fitness, a delicious catered dinner afterward and treatment from licensed massage therapists. The 10-K race can serve as a qualifier for those wanting to participate in a marathon. Call 867-7829 or e-mail orrindl@kscems.ksc.nasa.gov for information.